Gondar, the Bounty Hunter, is based off Akama, a broken Draenei who was once the Guardian of the Black Temple in the Outlands before it was taken by the Horde. In the Frozen Throne campaign, he and his clan assist Illidan Stormrage in defeating the Pit Lord Magtheridon. The Draenei are an ancient and enigmatic race, and Akama himself possesses fearsome stealth and combat abilities. In DOTA2, the Bounty Hunter is a support-type assassin, stalking his enemies while in stealth in order to track enemy movement and set up ambushes for his allies. His kit includes stealth, a crippling first strike attack, and a shuriken that interrupts enemy actions. His ultimate, Track, marks the enemy, giving allies vision, enhanced movement speed and most importantly, additional gold if they manage to kill the target. Above all, the main reason teams run a Bounty Hunter is for the gold advantage he brings to the team. The Bounty Hunter is a popular competitive pick, as he has the rare ability to solo the off-lane even against multiple opponents. This is because he is a hero that primarily needs levels (to get his ultimate as soon as possible) yet does not need gold (as he is relatively item independent). It would be rare for teams to run a Bounty Hunter in any other lane as they do not play to his strengths. The gold advantage provided by Track is substantial - see further down for more information. Extremely high "first strike" damage from Jinada allows him to solo weak supports with ease. Poor scaling on abilities means he isn't able to fight straight up against enemy carries. His abilities tend to be more useful in situations where your team is even with the enemy or has the early game advantage - as Track only awards bonus gold if your team is getting kills. If your team is on the back foot and not able to score kills on the enemy, the Bounty Hunter can be a dead weight. At Level 9 you will have 76 base damage, and ideally you would have Phase Boots (24 damage) and a Ring of Basilus (6 damage) for a total of 106 damage. Typically at this point you will have 1 level in Track and 2 levels in Shadow Walk (so the duration exceeds the cooldown). Players typically then have 4 levels Shuriken and 1 level Jinada, or the other way around - 1 level Shuriken and 4 levels Jinada. Jinada crit is 150% at level 1 (12 seconds cooldown), going up to 225% at level 4 (6 seconds cooldown). This means your initial crit does 159 damage at level 1, or 239 damage at level 4 - improvement of 80 damage. Shuriken goes from 100 damage at level 1 to 325 damage at level 4 (10 seconds cooldown in both cases). This is an improvement of 225 damage. You may get to use Jinada twice (with its 6 seconds cooldown). If you add the additional damage it provides over a regular autoattack (125%) you gain an addtional 133 damage. This brings the total damage improvement up to 212 damage, on par with Shuriken. Not only that, but you get the slow applied a second time. Shuriken is useful as an interrupt (it mini stuns) and you lose the utility of this if you're using it as damage - with a level 4 Shuriken build, you would be counting on using Shuriken once, waiting 10 seconds, and then using it again to finish the enemy off - they could use a TP scroll to escape. Also leaving Shuriken at level 1 and relying primarily on Jinada damage is not as taxing on the Bounty Hunter's mana pool, which is quite limited in the early game. The level 4 Shuriken costs substantially more. Overall, I would say levelling Jinada first is the superior choice, especially as it also allows stronger lane harass against the enemy. There are situations when levelling Shuriken first is better, in games where you do not want to be in melee range of the enemy - for example, when the enemies have deadly melee combatants like Tiny or Slardar, or if they have dangerous burst damage heroes in the early game like Lion. Then you would have to play more of a caster-type Bounty Hunter attacking from range with Shuriken and Track. Levelling Shadow Walk first is also not a bad choice if you anticipate spending a lot of time in stealth as it not only improves the duration, but also improves the fade time (allowing you to more easily disjoint projectiles) and the damage increase is also substantial (going from 30 damage at level 1 to 120 damage at level 4 is a 90 damage improvement). This amazing skill is the whole reason for the Bounty Hunter's existence. Not only does it give you vision of the enemy - allowing your team to initiate on them much easier, and also preventing them from initiating them on you - the +20% movement speed buff to all your allies in the fight makes such a big difference in attacking and retreating. It also prevents heroes from using stealth abilities to escape fights or initiate them. Last but not least, the gold advantage it provides is massive throughout the game. This means that if your team somehow kills all 5 enemy heroes while remaining alive, your team would be awarded an extra 4250 gold. Over the course of the game, as long as you are doing your job with Track, your team could be trading "even" with the enemy (2 kills for 2 kills) yet have the gold advantage slowly tip in favour of your team due to the extra gold provided by Track. The total team score could be 20-20 yet your team could be up 8000 gold by late game. Ensuring Track is applied to as many heroes as possible should be your main priority in fights. Track counters heroes with stealth like Rikimaru or Invoker, and also counters heroes with Shadow Blade as their core like Drow Ranger or Sniper. Teams with hard disables or heroes with PBAOE (point blank AOE skills) like Centaur, Slardar or Tiny can make life very difficult for the Bounty Hunter. If he comes in close to use his Jinada he can be instantly killed if the enemy has detection. As the Bounter Hunter is relatively item independent he buys movespeed and sustain items that will allow him to be more active in the map. You should always have a scroll of teleport available to use - if any fight breaks out you should immediately teleport to the location and join in. Even if all you accomplish is tracking the opponent before he dies, the bonus gold would be worth it in most cases. The items listed above is my preference for the Bounty Hunter core - Phase Boots, Urn of Shadows, Drums of Endurance, Vladmir's Offering. It has an easy start that will allow you to remain in the lane despite harass (ring of regeneration and sobi masks) that transitions into a relatively cheap core that gives you good regeneration and survivability. Some players like to play the Bounty Hunter as a farming carry and build Phase Boots + Battlefury on him, for about the same cost as the above. The Battlefury is a highly efficient item in terms of the damage and regeneration value you get from it, and it will make your Jinada opener crit for a very large amount as well as enable very quick neutral farming. This isn't generally recommended though - Battlefury is normally bought on farming type heroes who spend the early and mid-game farming to procure a set of end-game items - this is counter to the entire concept of the Bounty Hunter, who is designed to be extremely active from level 6 onwards in order to secure his team a large gold advantage. Not to say this isn't possible, but it's certainly not the most optimal way to play him unless the team was somehow depending on you to be the #1 position carry. As the off-lane solo you will be expected to buy the first set of wards to stop the enemy safelane neutral pulls. You should also pick up a stout shield, a tango, and maybe two branches. The single tango can be enough to sustain yourself until you buy the ring of regeneration (if you're following my build) - the Bounty Hunter has better than normal base health regeneration (0.75 per second, versus most heroes who have 0.25 per second). 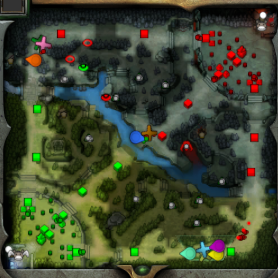 I played a series of Very High Skill games on Bounty Hunter on the weekend, and as you can see in the map above, in one game as the Radiant off-laner I managed to ward their neutral pull with a somewhat unusual and useful ward spot I mentioned in a previous post about dual purpose wards. The enemy support was unable to deward my pull blocking ward, and so I was technically able to "win" my lane - reach level 6 in a reasonable amount of time without dying so I can begin ganking other lanes, while keeping their support under-levelled - he's unable to find a source of XP through neutral pulls as he is trying to give the lane XP to his carry. Watch the screenshot I took above of the minimap where I ward the dire pull (my green ward) and he unsuccessfully places two sentries (hollow red circles) in an attempt to find it, wasting time and money doing so.